How, you wondered, could an author follow the smash finding-herself chartbuster Eat, Pray Love? 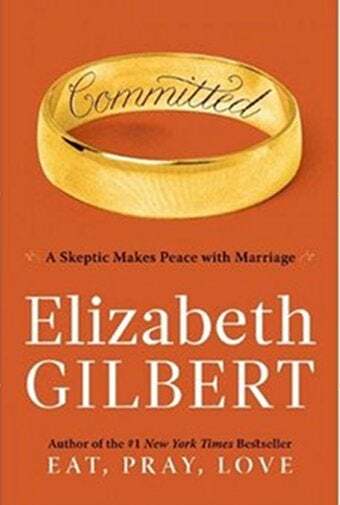 Here's your answer: Committed: A Skeptic Makes Peace with Marriage. Elizabeth Gilbert is an easy target. Ever since Eat, Pray, Love, she's been a byword for a certain kind of navel-gazing modern entitlement that cherry-picks from cultures and spiritual traditions in a quest for self-fulfillment. Yet the phenomenal success of that book shows Gilbert was onto something - or at least that she's a likable enough writer that she can get away with a lot. And it's true: in that book, whenever you felt like you couldn't take another moment of the author's peripatetic self-exploration or listen to another bit of folk wisdom, she'd give you humor, or self-awareness, that made you read just a little more. And by book's end, when she'd eaten and prayed her way across the globe and rediscovered her authentic self and recovered from her nasty divorce, we were happy for her to find love with a courtly gem-dealer and love happily ever after. Enter Memoir #2. Book #2, like the sophomore album, is tricky. (And although she's written a number of other books, this is certainly memoir #2.) Like the sophomore album, an artist who made his name chronicling the push for success has to deal with the fact that he knows, and we know, that as a result he's now rich and famous and not really one of us at all. Julie Powell addressed it by fleeing to a butcher shop. Gilbert, for her part, has ignored the success - or, at any rate, chosen to set her second chronicle in the window between the first book's writing and its triumph. As such, we find her still an everywoman of sorts, and without the means to skate through life as we tend to imagine the phenomenally successful do. And that's no small point, because this is the story of red tape. Specifically, of the red tape that forces Gilbert and her adoring partner, Felipe, to marry for legal reasons - despite a stated vow never to go through the hell, hypocrisy and arbitrary binding of that ordeal ever again. The book, then, finds Liz and Felipe waiting out their legal woes before they can marry. Because this is Gilbert, it means hanging out all over the world, and gaining insights and truths about her own life from various wholly unrelated peoples. It also means a lot of research: Gilbert is someone who, by her own admission, made her decision not to have children based on a program of organized research, reading, and interviewing. Now, she applies the same principles to marriage, wanting, this time around, to go in with an idea of what she's getting herself into. And so she reads about the practice's beginnings and antecedents, its basis in business, its connection to the church, its romanticization, its general historic pragmatism. To her dismay, she finds that marriage has, traditionally, frequently been a business exchange that subjugates women. Anyone who's contemplated marriage has, at least ideally, put some thought into what it means in a time when neither society nor security demands it. Gilbert's inquiry differs in that the marriage is a foregone conclusion. (The unworthy amongst us, whose concerns about marriage tend towards the material, might think resentfully that since children and finances are off the table, it's a rather easier question than it might otherwise be.) One thing I really wondered, reading the book, was whether it could serve as a useful primer for other women contemplating the estate - whether, in other words, it holds larger application. (I'd already deemed its entertainment value to be somewhat lacking.) Well, yes and no: what Gilbert unearths, although familiar to most people who've done a survey course, is interesting and at times thought-provoking. However, her conclusions are necessarily personal - and, of course, moot, given that the book's going to end, inevitably, with a wedding. If there's an arc to the book, it's whether she'll resign herself to it. And just as Eat, Pray, Love ended neatly (if serendipitously) with romantic love, so too does this end happily with a wedding to which the author is more than resigned. Because, of course, marriage defies logic. Gilbert's book, like the predecessor, is saved from its worst faults by the author herself, who comes off as a nice person, generous-spirited, whom one wouldn't mind sharing a chai with. And that's a good thing: at one point Felipe, who adores her, rebels at having to sit through an endless, rocky south Asian bus trip to a vague destination of Gilbert's choosing. The reader knows how he feels.